A large-scale computing environment based on high performance computing (HPC) is essential for Okinawa Institute of Science and Technology (OIST) to promote cutting edge research. Since the number of students, researchers and laboratories has grown significantly, the old system was unable to handle the analysis demands. 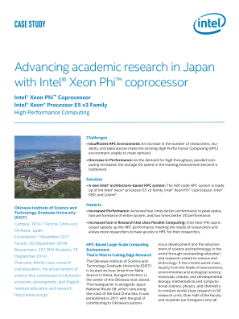 OIST constructed a new HPC cluster with Intel® Xeon® processor E5-2600 v3 ...product family and Intel® Xeon Phi™ coprocessor to meet future computing need for future researches. Performance of the new HPC cluster not only benefited from the new Intel® Advanced Vector Extensions 2 (Intel® AVX2) feature in Intel Xeon E5 v3 processor family, Intel Xeon Phi coprocessors enables the cluster to achieve ground-breaking performance in massively parallel applications. Intel Xeon Phi processors in the cluster allow reuse of the source code developed for the widely used Intel® architecture programming model, and allow OIST to run more complicated simulations without rewriting codes while reducing computation time. Personal Ultrabook™ 2 in 1 systems empower Northern Michigan University students and faculty.